To be clear, he only hunts living snowmen. He used to use a sniper rifle and pick off snowmen from afar, but that resulted in many confused and horrified children when he fell for a decoy. Hey there’s more stuff being added to the Store! 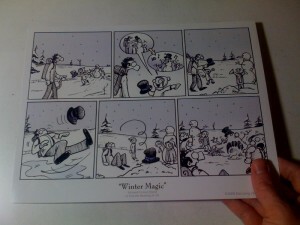 Do you like the silent comic “Winter Magic“? Now you can get it on an 8.5”x11” glossy print, signed with a hand-drawn sketch of Edmund on the back! There are 20 available at this time. There’s more stuff to come which will be announced here and on the Facebook Fan Page. Contests coming soon as well! Now on to a serious topic: My conspiracy theory about Airwick Air Fresheners. There are two settings: A burst of freshness every 30 minutes, or a burst of freshness by motion sensor, so you don’t waste it. HOWEVER, I firmly believe that the motion sensor is a trick. How do we know that thing isn’t spraying freshness all the livelong day while you’re gone at work? How would you know? Maybe “motion sensor” just means “sprays every 5 minutes, so you think it’s detecting your motion when you’re there and you have no idea it’s spraying when you’re gone.” Clever, Airwick, very clever indeed. You know what I’ll do? I’ll set up a camera pointed at the Airwick air freshener while I’m away, for days. That’s it. Just a still camera, on a tripod, pointed at a can on a shelf. Then I’ll edit the footage together and win an independent film festival because none of the critics will want to admit they didn’t understand the film.